Pixar has made quite a name for itself thus far, and why shouldn’t it? With so many incredible stories and expanding visuals, they are hard to miss. Lately, however, they’ve been dropping ever so slightly in the power of their oomph. Cars 2 is commonly referred to as the worst Pixar movie, and Brave isn’t that far behind. They look great, but some speculate that they’ve lost their edge in regards to storytelling. I’m not quite as harsh as other critics, but I do understand where they are coming from. One Pixar flick that we’ve all been interested in seeing, if only to see how it was done, was Monsters University, the prequel to critically acclaimed Monsters, Inc.
All good stories have to begin somewhere, don’t they? Well, we all know the story of Monsters, Inc, and we’ve all met Mike Wazowski and Sully, but…how did it all start? Well, as a young…adorable little thing, Mike always dreamed of being a scarer, so when the time came, he enrolled in Monsters University with a major in scaring. However, throughout his life, other monsters looked down on him and thought he didn’t have it in him, while monsters with a reputation like Sully, did. 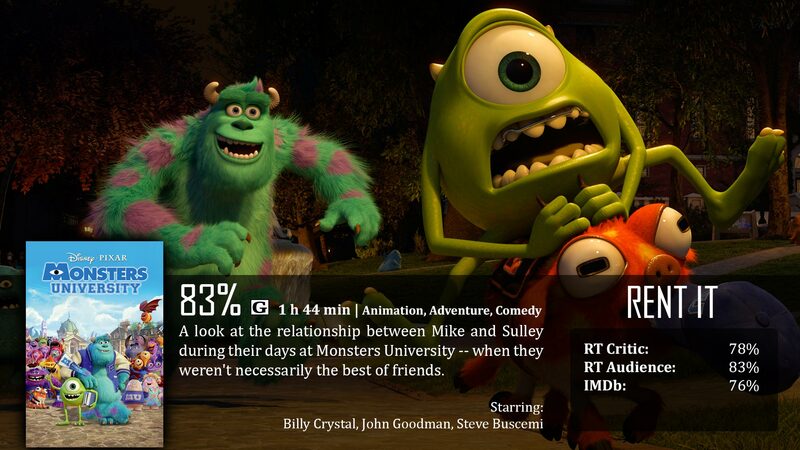 So naturally, Mike hated Sully. After their hatred towards another gets them kicked out of the scaring program, Mike and Sully enlist with a few other unimpressive monsters to play in the scare games. If they win, they get back into the scaring program, if not, well…they must leave the campus. To give you an idea of how this movie plays out…it’s a little like Toy Story. We have Sully show up, and everyone takes notice of him while Mike is stuck trying to legitimately prove himself, so they fight and end up…away from where they should be, fighting to get back – obstacle by obstacle. You’ll only really notice that if you’re really paying attention though, because there are plenty of differences between Toy Story and Monsters University. Mike isn’t like Woody, he is no favorite, but leader? Possibly. Toy Story was also an adventure and fish out of water story while this is more of a system of games. So the route is different, but the basic underlining plot advancement is relatively the same thing. What I mostly worried about in this film was what I would have rather seen. I wanted to see a sequel to the film, not a prequel just to have to start at square one again. I wanted to see the sequel to see how their realization with Boo affected both worlds, especially Earth. There was a lot of different ways they could have actually done that, and only because I didn’t see what I wanted to, I was slightly disappointed, but I’m happy with how they did this. It didn’t completely backtrack, because the film wasn’t completely about scaring as it was about team work, friendship, and getting over conceited ways, mainly for Mike and Sully (obviously). I will say that this wasn’t the worst Pixar in the world, I definitely enjoyed it, and would call it an overall success. I’ve seen better though. Actually, I can probably give a good list of better Pixar flicks, Monsters, Inc. included. Monsters University is not as good as its predecessor or many other Pixar flicks, but it is still entertaining for both children and adults alike. Adults, you may notice references and inside jokes here and there of college life, but it’s not obvious for kids. Children will love the amazing visual details, the colors, the different shapes and sizes of the monsters, but they may be a little lost on the college life aspect. The kids part of the target audience go to preschool and elementary school primarily, so they might not connect with the college life aspect, however…there is a possibility that it may start up some kind of interest into a higher education. As far as children movies go, that’s impressive all on its own. Gotta give props there.